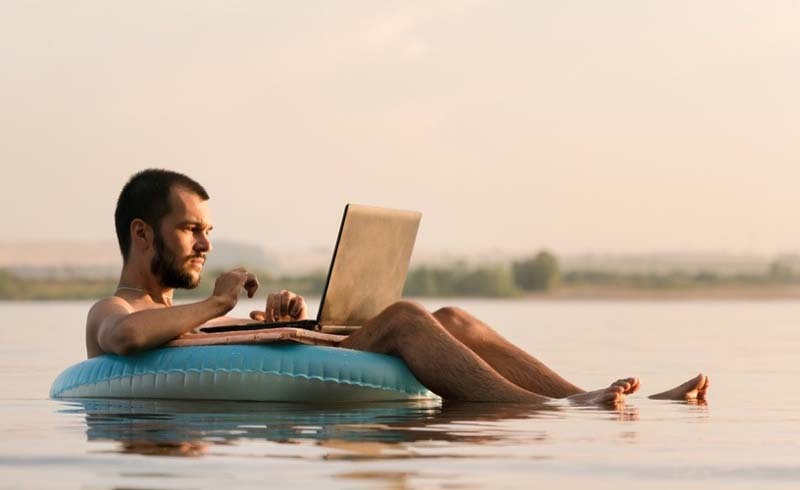 Is your business making it hard to take a vacation? These seven tips can help you get away. Scheduling a vacation can be challenging for anyone, but it’s especially difficult for business owners who fear losing clients, missing opportunities, or worse while they’re gone. As a result, they work nonstop, jeopardizing their physical and mental health, as well as their relationships. That’s why, if you own your own business, it’s essential to schedule vacations. Not only can vacations reduce stress, strengthen your relationships, and help prevent heart disease and other ailments, they can increase your productivity and creativity when you return. These seven strategies can prepare you, your clients, and your employees for your departure, so you can enjoy the downtime you so desperately need without worrying about your business. If you have employees, taking a vacation is much easier when you regularly delegate tasks to them and allow them to make some decisions on their own. The tighter your grip on the reins, the more difficult it is for you to let go (and for your employees to run things while you’re gone). Giving your employees some autonomy can help identify those you can rely on when you’re gone, too. Does one person have a knack for technology? Make her the go-to for any computer-related problems while you’re away. Many business owners are reluctant to vacation because they fear Murphy’s Law—anything that can go wrong will go wrong while they are gone. Beat Murphy to the punch, and prepare for his arrival. If the business website crashes, what should employees do, step by step? If they can’t get it back up, is there someone they should call? It’s a good idea for you to have a list of important contacts, including phone numbers and email addresses, with you, so you can reach your IT specialist or building manager, if necessary. Keep a physical list (in case your devices are damaged or stolen) in an easy-to-access place in your duffel or travel gear. When you travel can make all the difference. Schedule your vacation during your company’s slowest season. If you own a pool cleaning company, that’s probably the winter months. Try going in the summer, and you’re likely to have more emergencies arise and more trouble distancing yourself from work. In addition to traveling during the slow season, don’t time your vacation around anything going “live,” like a new website or a new product launch. You don’t want to have to handle last minute problems or mistakes remotely. 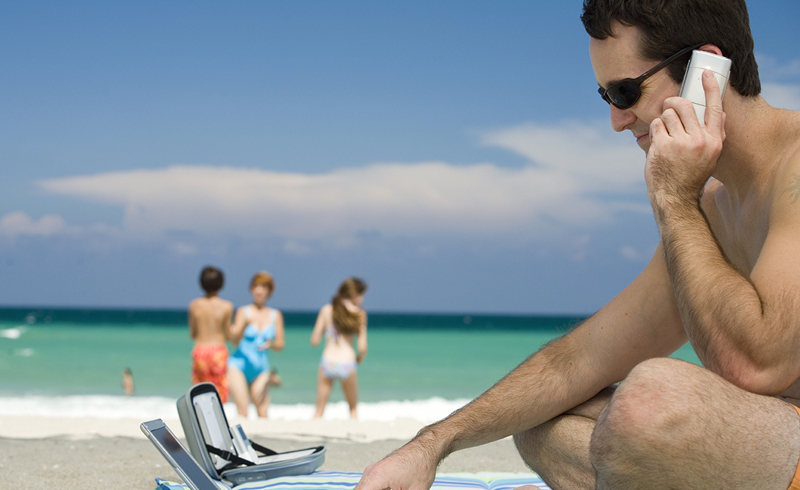 Once you’ve decided on a time, let your clients know you’ll be on vacation. For example, an accountant may want to send an email to clients informing them of the dates he’ll be gone. Or a restaurant owner may want to note the restaurant’s closure on its website and at its entrance to alert customers. Depending on your clients, consider telling them you are leaving a day earlier than you actually are to minimize last minute requests while you’re trying to pack. You may also want to extend the date of your return by a day to give yourself time to catch up before fully engaging. Rather than close your business entirely while you’re gone, find someone to temporarily step in. A dentist can make arrangements for another dentist to cover any emergencies his patients might have while he’s gone in return for him doing the same when his colleague wants a vacation. The owner of a manufacturing firm might ask a subordinate to manage the company while he is gone or call in a retired colleague to help him out. Before you leave, train your replacement. Explain your day-to-day procedures, make sure your expectations are clear and introduce your replacement to your employees. You may even want to have a trial run for a day before you leave to see what issues need to be addressed. Or, turn a business trip into a bleisure trip, spending part of your time disconnected and having fun. Even if you’ve told your clients about your vacation, prepared your employees, and have experienced people lined up to deal with emergencies, it can be difficult to let go. Fight the urge to work, but if you must, follow these tips for working remotely and limit the time you spend working. Pick a specific time of day to do work, set a timer, and then physically put your computer and tablet away in your luggage . Of course, there are times you need to be available. In those instances, you’ll want to have your laptop, tablet or at the very least your phone available. Stow them in your day pack, preferably a laptop backpack that is waterproof and has a separate, padded compartment for your computer. Sometimes, you do need to stay in touch with employees and clients. Before you leave, define what an emergency is for your employees and tell them only to call you under those circumstances. Or, check in with them at a specified time once a day. They may not feel the need to bother you knowing you are going to call later. Plus, they can keep you up-to-date on business happenings.It can be harder to limit contact with clients. Consider using a voice answering service while you’re gone, and setting up an automatic response for your emails. If you’ve put off traveling for far too long, make this the year you embark on at least one of your bucket list travel adventures!